Marvelous Darlings haven't had any records out in a few years, but for a several year run they released some of my absolute favorite 7"s. The compilation of those records, Single Life, is a record I still spin all the time. The fact that they split up still bums me out on a semi regular basis. 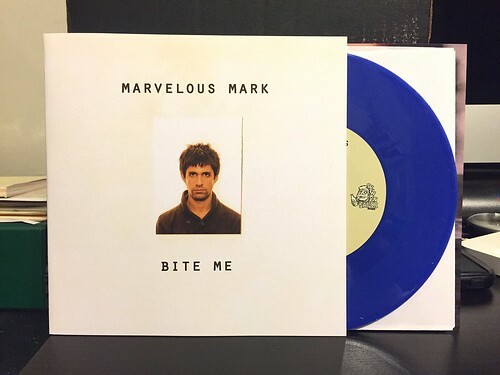 Ben Cook is still busy playing in Fucked Up and Young Governor, but this is the first record by Marvelous Mark that I've been able to grab. It's not the first record he's released. That honor goes to a lathe cut 7" put out by Ben Cook's label that I was too cheap to buy. Luckily the A side of that record is the lead off song on this new 7". "Bite Me" may not qualify as Marvelous Darlings 2.0, but it's actually a really great guitar pop song that reminds me a lot of early Ash. Sure, maybe not as polished, but the hooks and melodies are still there. "Waiting" keeps up that mid tempo motif with a positively Doughboys-esque rocker. Again, I can't say it sounds much like the Marvelous Darlings did, but this is a great song and my favorite on the 7". The B side wraps up with the frantic "I'm Freaking Out." It's probably the song that sounds closest to Mark's prior band as it's much faster than the prior two, but again this is a sound much more at home with the mid 90's Senseless Things/Doughboys crowd. It's a funny thing, I've missed the Marvelous Darlings so much, you'd think I'd be pretty bummed that the songs on this record really don't sound much like that. Luckily, Mark has tapped into another vein of music that is right up my alley. If you are into big 90's guitars and catchy songs, you'll be hard pressed to find a better 7" than this.